The Railway Stakes is one of the three Group 1 races run at Ascot Racecourse during the Perth Summer Racing Carnival each November in Western Australia. Offering $1 million in prize money the Railway Stakes is a handicap race contested over 1600m and is the opening Group 1 Perth race of the season. The weight-for-age Group 2 Lee Steere Stakes (1400m) held at Ascot a fortnight before is the key lead-up, but the double hasn’t been achieved since Belle Bizarre (2006). The last Railway Stakes winner to back-up off a Lee Steere Stakes run meanwhile was Great Shot (2nd in 2017). Many graduates go on to run in the Group 1 Kingston Town Classic (1800m) back at the track over 2000m further the next month, Sniper’s Bullet (2009) the last to win both Perth Group 1s without another run in between. The latest edition of the Railway Stakes ran on Saturday November 24, 2018 . The official Railway Stakes 2018 Results & Finishing Order is now published below as of Saturday November 24, 2018 . Futures betting on the Railway Stakes offers all-in prices on the probable runners a month before following the nominations, generous odds are on offer for punters at this stage. The markets firm once the Railway Stakes final field is released and offer more security for those placing a bet on the handicap classic. RJ Peters Stakes and Lee Steere Stakes graduates from earlier during the Perth Festival of Racing traditionally dominate the Railway Stakes odds, and last start winners have a good strike rate in recent years. Favourites have a poor recent Railway Stakes record however with just two winners between 2007 – 2017, most recently Luckygray (2011). The summer’s top Railway Stakes 2018 betting markets and links to the Railway Stakes odds will be provided below the week of the race so stay tuned for the best Perth racing markets on the hopeful milers. 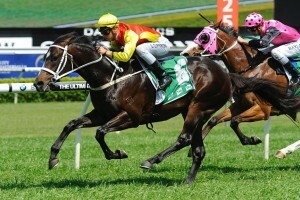 Railway Stakes tips favour locally-trained horses with previous winning form over a mile and at the firm Ascot track. Runners coming off a top four finish in the Lee Steere Stakes usually make a good Railway Stakes bet, with lighter-weighted runners usually the way to go tipping-wise. Other race tips include looking for the in-form four-year-olds in the race as they have the best strike-rate in recent years and for those at double-digits in betting with upsets not uncommon. Our Ladbrokes’ insider Railway Stakes 2018 betting tips and Perth Group 1 racing selections on the mile classic will be detailed below the week of the race so bookmark this page for the runners to back and sack this summer. The Railway Stakes field attracts the season’s best milers and staying types, mainly from around Western Australia with the locals holding the advantage over the visitors. A number of interstate raiders have made the trip over to line-up in the Group 1 over the years including the Chris Waller-trained Good Project from Sydney who won the 2015 edition. Good Project (pictured at Randwick) beat home the locals in the 2017 Railway Stakes for Sydney’s Chris Waller. Photo Credit: Steve Hart. Most horses that contest the Railway Stakes come via an early Perth run in the Group 2 Lee Steere Stakes (1400m) that has produced more Railway winners than any other race in the past 20 years, most recently Great Shot who improved on a lead-up second in 2017. Railway Stakes nominations close a month before the race before the final field is released the Wednesday before the event runs on the Saturday. The official Railway Stakes 2018 Field of Final Acceptors is set for release the Monday before the race followed by the Railway Stakes 2018 Barriers on the Tuesday, so stay tuned to see what gun gallopers make the line-up in the million dollar feature. The official Railway Stakes 2018 Nominations & Weights will be provided below once announced by Perth Racing a few weeks out from the season’s opening Group 1 Perth summer showdown. The Railway Stakes form guide shows punters all the must know info on the race pre-betting including the saddlecloth numbers, barriers, jockeys, trainers, weights and lead-up runs of the horses in the field. Lee Steere Stakes graduates have an ace record so looking for this lead-up race on the form is important, as is checking the form on the horse drawn in barrier 12. Barrier 12 produced four of the Railway Stakes winners from 2009 – 2017 so is a coveted gate to draw. A link to the full Railway Stakes 2018 Form Guide will be provided below the week of the race. Double-figure runners have dominated the Railway Stakes results in the past decade with the most notable upsets achieved by $21 chances Mr Moet (2012) and Luckygray (2013) who also won the 2011 edition as the $3 favourite, while Great Shot ($31 in 2017) became the longest-priced Railway Stakes winner since Sanatate ($34 in 1983). Other noteworthy Railway Stakes winners in recent years include Elite Belle (2014), Sniper’s Bullet (2009), El Presidente (2007) and Northerly (2000).